I grew up grouper fishing in the Gulf of Mexico. In search of the big one, we inevitably pulled up a lot of Rock Bass. Members of the grouper family, these smaller fish, also known as Black Sea Bass, share a love of deep water and rocky habitats with the Red and Black Grouper we were seeking for our table. After reeling up 80 feet of line, the sight of a Rock Bass and no bait meant this fish endured a lot of angry muttering as I slipped it off the hook and tossed it back into the sea. Catching sometimes a dozen in one morning, we never kept a single one. Fast forward to a couple of weeks ago when a client requested a class on fish cookery. Among other things, he wanted to fillet a whole sea bass and then pan-sear it. I set off for Whole Foods to see what kind of whole fish they were carrying and there, snuggled into ice with a $10.99/lb price tag, was my nemesis. Line caught from the North Carolina coast and looking quite dandy next to some beautiful red snapper was my rock bass. The only sea bass available for sale, I was a bit sullen bringing it home. When my husband asked what was for dinner, I disdainfully replied “rock bass” and launched into a lengthy diatribe about how I couldn’t believe the fish I had discarded for years was for sale at swanky Whole Foods. Then I cooked it, took a bite, and had to do the most unpleasant thing: admit I was wrong. Certainly a day or two old by the time I bought it, there was not a hint of age in the final dish. Flaky, sweet flesh without a bit of fishiness and a skin that when crisped was redolent of bacon, this fish, both my husband and I agreed, was the best we have ever had in our landlocked home of Charlotte, NC. Reeling from disbelief, I went back to Whole Foods, bought another Rock Bass and repeated the experiment to the same results. And now? I’m making plans to go Rock Bass fishing the next time I’m in Florida; those grouper better not even think about biting my line. 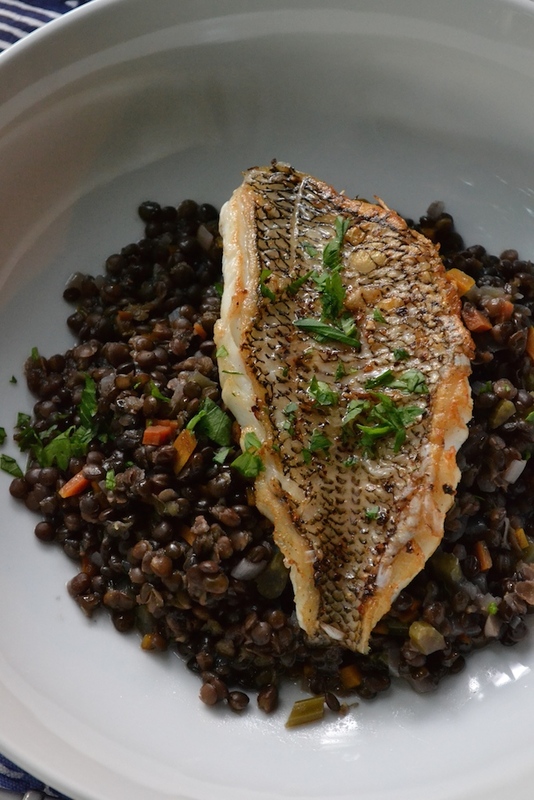 If purchasing whole black sea bass, ask that the fish be scaled and filleted. Be sure to pat the fish dry before coating it with the oil so it doesn’t stick to the pan. Along those same lines, a hot pan is key to getting a really crispy skin. Remove any bones from the fillets with tweezers. Place the fillets, flesh side down, and cut three slits, just through the skin, on each one. Pat dry with paper towels and lightly rub canola oil on both sides. Season with salt and pepper. Heat the canola oil in a heavy-bottomed pan until hot, but not smoking. Add the fish, skin side down. The fish will immediately appear to seize up. When this happens, gently press the fish flat with a spatula for a few seconds. Release and let it continue to cook until about 70% done (cook time varies depending on the size and thickness of the fillet). Flip the fish and cook the other side until done. 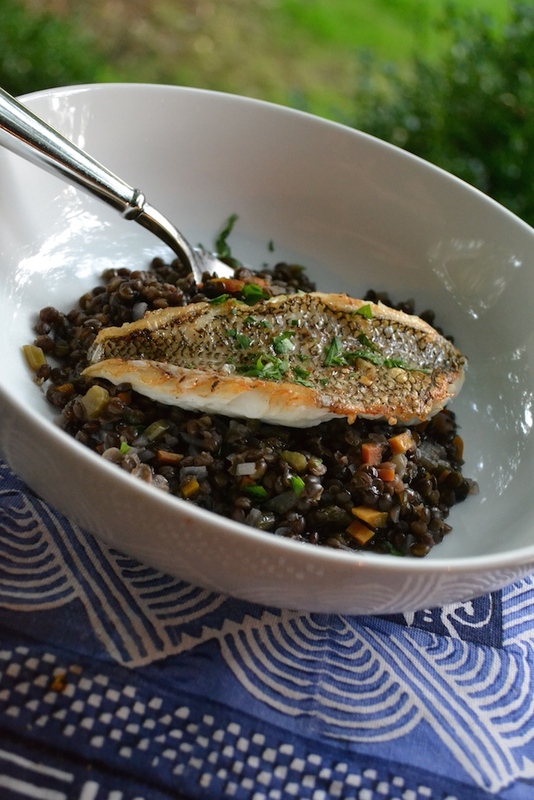 Remove from the pan and serve immediately over the black lentils. 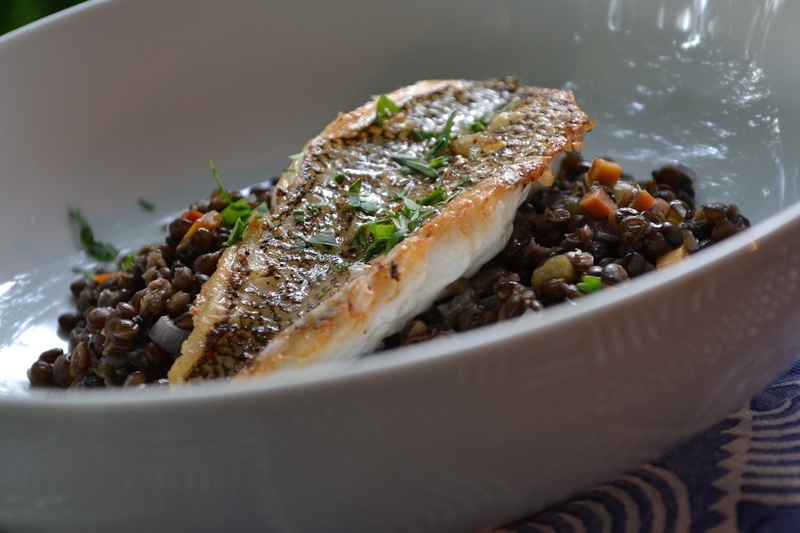 Any lentil can replace the black lentils in this recipe, but black lentils (also known as caviar lentils) are particularly elegant. Holding their shape during cooking and glistening under the pan-seared sea bass, they make this quick and easy dish quite a showstopper. Heat a medium saucepan over medium-high heat. Add the olive oil. Stir in the celery, carrot, and shallot. Cook, stirring often, until vegetables are soft about 4 minutes. Stir in the garlic and cook until fragrant, about 30 seconds. Add the lentils and stir to combine. Add the vermouth and cook, stirring constantly, until almost completely evaporated. Pour in the hot water and add the bay leaf. Bring to a simmer. Partially cover the saucepan and simmer for 30 to 35 minutes or until tender. Season to taste with salt and pepper. 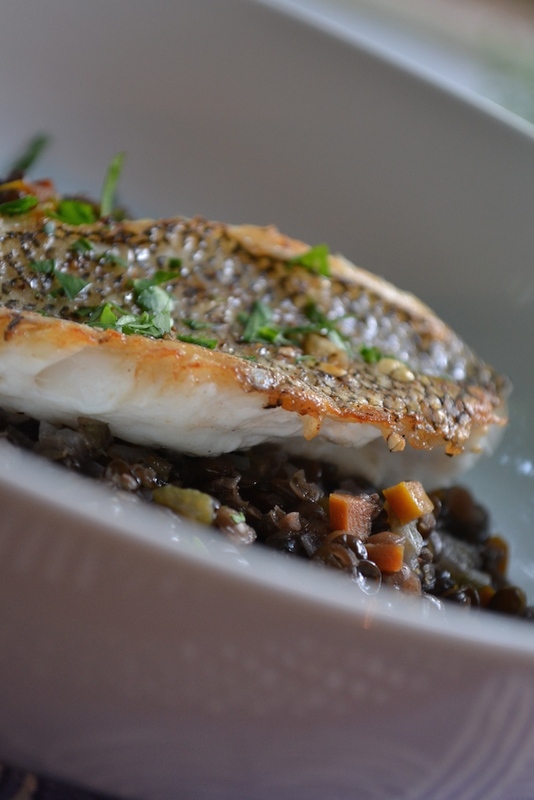 Serve as desired; lentils are delicious as a side dish or as a hearty main course. Very impressive. simple and elegant. Wit good technical ability a seriously good dish. oh that looks yum and healthy too!